As you may already know, a small chip or crack can easily worsen if it isn’t fixed, leading to the windscreen needing to be replaced. 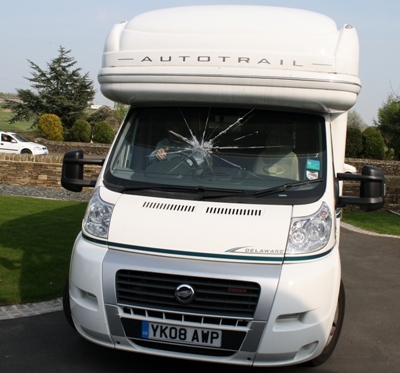 However, a quick and simple repair from a company such as AutoGlass can make the windscreen good as new, and side step the risk of having to make a claim on your motorhome insurance policy to replace the windscreen. If you are an existing Caravan Guard motorhome insurance customer and notice a chip or crack in your windscreen then you should call our dedicated windscreen helpline number on 01422 501 092 (number updated 13/12/2018), and we’ll get your motorhome repaired as quickly as possible, completely free of charge, and with no reduction in your insurance no claims bonus. Teresa Eastwood, Caravan Guard’s Claims Liaison Manager, explains why fixing a chip quickly is so important. When making a claim for damage to your motorhome’s windscreen or windows you won’t even have to complete a claims form. If the windscreen is beyond repair and needs to be replaced you will only pay the windscreen replacement excess of £100, and providing the claim is less than £1000 your no claims bonus still won’t be effected. For more information on the cover provided by Caravan Guard for windscreen damage take a look at the motorhome policy booklet, or for more general information on our benefits and discounts visit our motorhome insurance page.